For the third year, Limitless La Vie is proud to be a sponsor of the High School of Art and Design Student Design Competition Fashion Show. This annual show showcases the creative talents of the fashion design students, while at the same time giving them the opportunity to win scholarships and get the attention of potential mentors. Previous years’ winners and finalists have gone on to study at prestigious design schools such as the Pratt Institute, Parson’s School of Design and LIM College. This year’s theme was Mélange: Live It, Walk It, Culture It. “Mélange”, which translates to “a mixture or medley,” vividly describes this year’s fashion show inspiration, the multicultural nature of New York City. We sponsored the career-wear category, where students were given the challenge of creating a sustainable career-wear look for Michelle Obama. Three finalists were selected from all the entries. An important component of the assignment for these students was sustainability, starting with the use of fabric from ethical sources. Limitless La Vie pre-selected a 100% cotton yarn dye jacquard that all the contestants were required to use in their designs. This beautiful fabric from Piece & Co. was woven in India by a women-owned business. Each student completed their vision using textiles donated by FabScrap, a non-profit enterprise which saves fabric remnants from high-end designers such as Marc Jacobs, Eileen Fisher, Oscar de la Renta, and Mara Hoffman from ending up in landfills. Pratt’s Brooklyn Fashion and Design Accelerator (BF+DA) constructed the finalist’s designs, following sustainable best practices. The winner’s dress was shipped to Michelle Obama using custom eco-friendly packaging donated by EcoEnclose and imprinted with the story-line “Journey of a Sustainable Dress”. The finalists in this competition reflected the diverse population of New York City. Alivia Matthews is half-Dominican and half-African American, born and raised in the Bronx. Diane Salahaldin is a Palestinian-American, and Usury Sacramento is Mexican. They used inspiration from their own backgrounds, the dynamic creativity of New York, and their own personal vision to come up with three very different looks for Michelle Obama. In the end, one winner had to be selected, and the judges chose Alivia Matthews. She was awarded a $5000 scholarship from Limitless La Vie, and her winning outfit was sent to Mrs. Obama. Alivia will be continuing her study of design at the Fashion Institute of Technology. Diane Salahaldin finished in second place, and Usury Sacramento was third place. They both received a token of appreciation. Congratulations to all three finalists! Help Limitless La Vie encourage up-and-coming designers working with sustainability in mind! You can offer your support either by purchasing Limitless La Vie clothing- 100% of our profits go towards philanthropic causes such as this scholarship- or by donating directly to the scholarship fund. In step with our commitment to support education, and in recognition of Michelle Obama’s outstanding service in support of education for young women and girls and in the facilitation of educational opportunities for adolescent girls in developing countries, Limitless La Vie is pleased to acknowledge its donations totaling $10,000.00 to support the Peace Corps Let Girls Learn Initiative. 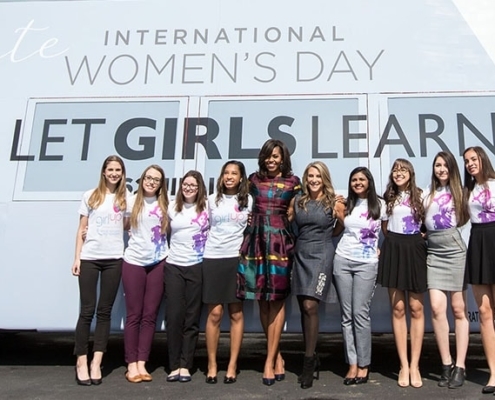 Since its launch in 2015, during the Obama Administration, the Let Girls Learn Initiative introduced by then First Lady Michelle Obama has been an essential and effective means of advancing girls’ education all over the world. Michelle Obama promotes her ‘Let Girls Learn’ initiative in London. As a role model, First Lady, Michelle Obama became known for her advocacy for such issues as poverty awareness, nutrition, healthy eating and physical activity and promoting international education for women. At Limitless La Vie, we believe that education has the power to unlock the fullest of potential and transform lives through opportunities. To that end we are pleased to announce our list detailing the programs we have funded in 2017.